Black Flag was unquestionably one of the most influential American post-punk bands. They were key definers of the image and the aesthetic. Through their ceaseless touring, the band cultivated the 80s American underground punk scene. Black Flag played in every area of the USA, influencing countless numbers of bands. Black Flag created a ferocious, edgy, and ironic amalgam of underground aesthetics and gut-pounding metal. Their lyrics alluded to social criticism and a political viewpoint, but it was all conveyed as seething, cynical angst. Furthermore, Black Flag demonstrated an affection for bohemia -- both in terms of musical experimentation and a fondness for poetry that reiterated the band's underground roots. The Black Flag name and four-bar logo became punk institutions. 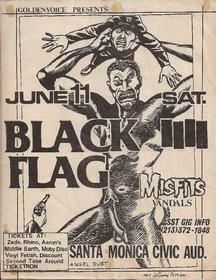 The images below are all original Black Flag flyers, many designed by Raymond Pettibon.